This one is lovely! ^^ I love the bright colors you used, it fits her just fine! ^^ and the scan is very cute. Keep it up! Very nice. The effects are nice and give the piece a light, gentle feeling. I don't know. It's good. :) The scan fits in very well. Kawaii!! Shinobu looks great and the lights are great. This is so cute ^^ :D Her smile is sooooooo adorable. I love the background and the way the text blends in. I'm suprised :o you didn't leave your credits on it. I really like this wall. The colors and the scan selection are so well suited together. The mood is projected clearly. She is a happy girl just come in from the sun. nice lovehina wall love it add to fav. 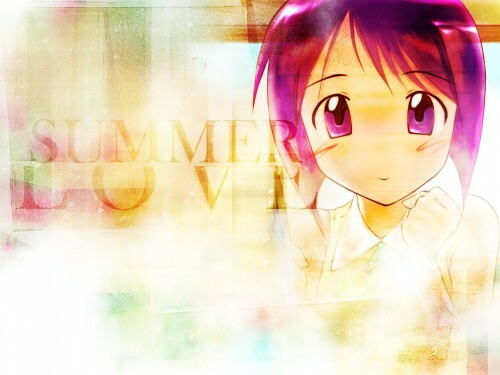 Cute shinobu wall, i really like the effects, and all the image. So cute. I like Love Hina very much. Kawaiiiiiiiii K E E P I T U P ! ! ! ! SHinoBu lOoK zrealLi Cute ere >,<!!! !